Among the Canadians who braved the winter cold, this Monday February 4, 2019, marching from Prime Minister Justin Trudeau’s Office, across from Ottawa’s Parliament, to the U.S. Embassy and onward over Sussex Drive to the Ministry of Foreign Affairs, where the Lima Group was meeting to formulate their strategy against their foe, embattled Venezuelan President Nicolas Maduro, there stood a highly visible red and blue flag. This bi-color bares resemblance to the Venezuelan tri-color. However, many would recognize it as that of the Republic of Haiti. There are two important factors that give special significance to this observation. Both are rooted in fascinating history. 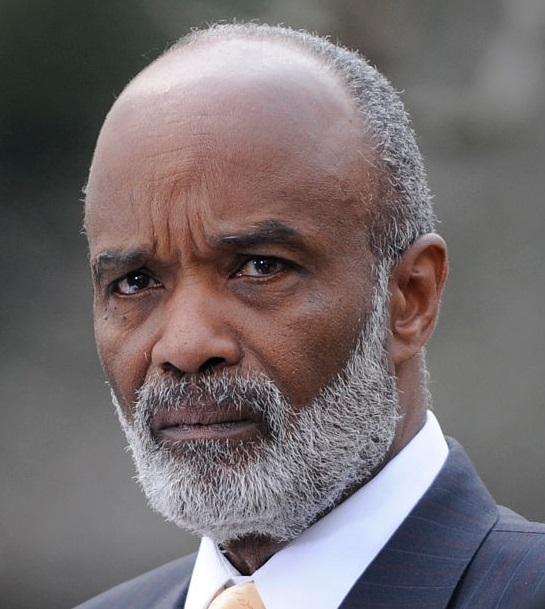 From January 31 to February 1, 2003, there was a conference known as The Ottawa Initiative on Haiti which took place at Meech Lake, Quebec (a federal government resort near Ottawa). 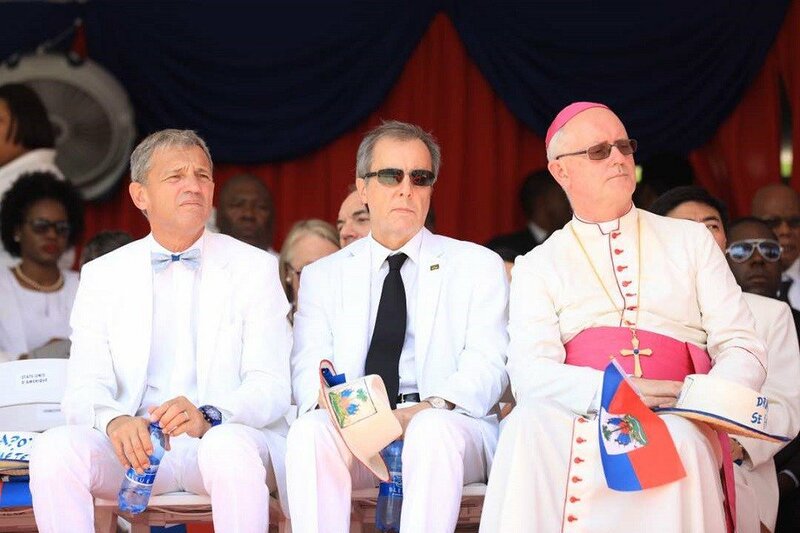 According to journalist Michel Vastel who first broke news of the secret meeting, Foreign Ministers of the United States, France and other countries gathered by invitation of Canadian Ministre de la Francophonie, Denis Paradis, had decided on the future of Haiti’s government. Having studied the matter and deliberated on what is best for Haitians, the white men and women deemed it necessary to topple their President, Jean-Bertrand Aristide, and his government and to place Haiti under U.N. tutelage. The Haitian flag which pro-Maduro marchers carried in Ottawa this afternoon was meant to remind the world that, 16 years after the infamous Ottawa Initiative on Haiti and, 15 years after the February 29, 2004 Coup d’Etat it effectively birthed, more impoverished than ever, Haitians are struggling under a brutal foreign-backed, narcotics-financed dictatorship. The Venezuelan flag contains the same red and blue of the Haitian flag because the flag of Greater Colombia, ancestor to the modern Venezuelan flag, was actually created in Haiti. It was a gift from Haitian revolutionary leader, founder and liberator Jean-Jacques Dessalines to South-American leader Francisco de Miranda. The year: 1806. The city: Jacmel, on the Southern coast of Haiti. 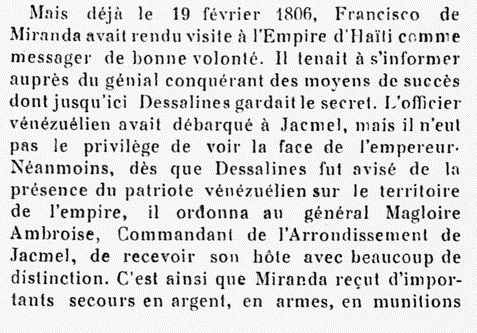 On February 19, 1806, Miranda was in Haiti, seeking help from Dessalines, who had successfully rid the island of French, British and Spanish slavers and declared the Republic of Haiti, a haven of freedom for all, especially kidnapped Africans who were enslaved in the Americas, since 1503. Miranda’s mission to Haiti was highly successful in that Dessalines ordered he be provided money, weapons and munitions to pursue the liberation of Latin America. 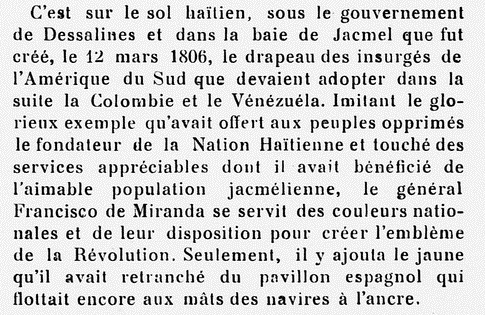 From this faithful meeting in Jacmel on, Haitians who helped Miranda and Bolivar always issued a singe demand in return: “that wherever they are victorious, the liberators of Latin America proceed to free all enslaved people”. It is indeed on Haitian soil, in the Bay of Jacmel, under the government of Dessalines that, on March 12, 1806, the South American rebel flag was born. It was to become that of several countries, including: Colombia and Venezuela. It is said that Miranda added to the Haitian red and blue, the yellow which he ripped from a Spanish flag. Thus, the presence of the Haitian flag in Ottawa this Monday February 4, 2019 afternoon was highly symbolic and timely. One of the speakers insisted that people who are genuinely interested in a peaceful and democratic resolution of the current crisis in Venezuela would be well-advised to not ignore or brush away the ugly, but sadly real, racial dimension of the conflict at hand. Indeed, there are disturbing signs that President Nicolas Maduro does not exaggerate when he describes many of his detractors as dangerous “Ku Klux Klan” ideologues. Tragic cases abound of public lynching of Afro-Venezuelans at the hands of anti-Chavista pro-coup forces in recent years. At today’s march, I spent several minutes discussing the issue of race in modern foreign policy with the CBC Radio-Canada journalists who went through great pains to justify why they did not wish to interview me on the link I was making between the 2004 coup against Haiti and the 2019 coup, now in the making against Venezuela. One « journalist » was visibly annoyed by the suggestion that racism might be a factor in the conflict engulfing Venezuela. I made sure they heard about Orlando Jose Figuera, the young Afro-Venezuelan who was lynched by a mob of racist anti-Maduro protesters in Caracas, on 20 May 2017. However, so much remains to be done to start to address this huge elephant in the room. 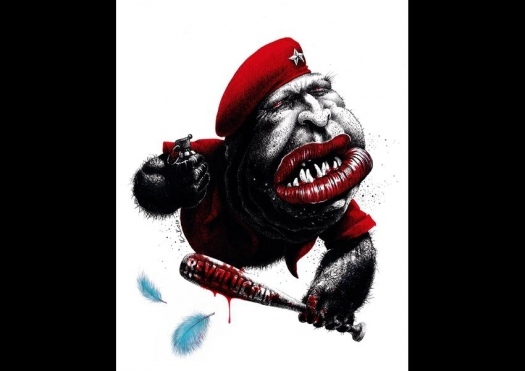 Lest I be accused of pushing “communist” propaganda, let me end this note with a couple of quotes taken from “Are Race and Class at the Root of Venezuela’s Political Crisis?“, an article published by The Voice of America. One year before the 2004 Coup d’État that toppled Aristide, he had dared issue a public demand for restitution of the French ransom which was, then conservatively, estimated at $22 billion. The former white slavers, French and the Americans cousins, working hand in glove, used gun-boat diplomacy and other strategies to collect that outrageous ransom from the impoverished black survivors of racial slavery, from 1825 to 1947. On May 10, 2018, dia de la Afrovenezonalidad, President Maduro, announced that Venezuela is now, the first country in Latin America to openly endorse the call for long overdue European and Vatican reparations to the indigenous peoples of Africa and of the Americas. Is it too much to aspire to building a much better world for our children? Is it too much to aspire to cheap gasoline at the pump without it being tainted with the blood of the innocent? 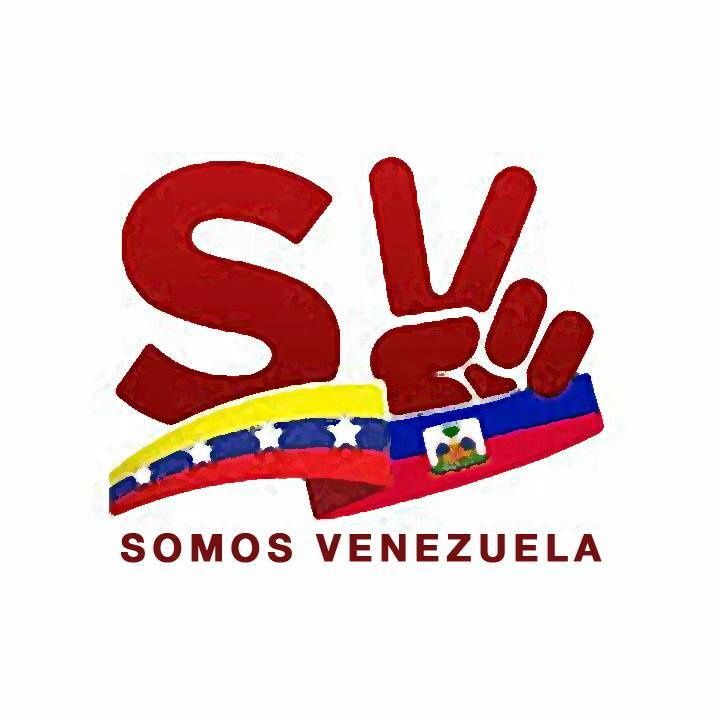 Could we not imagine and build a world where the gold of Venezuela serves to afford decent lives to the People of Venezuela – all the people of Venezuela! Indeed, some of us have made the decision to work tirelessly, with courage, honesty and with every fiber of our being, so that one day, the gold of Haiti, the coltan of the Congo, the cocoa of Ivory Coast… no longer serve as magnets that attract imperialist coups and kidnapping of progressive leaders which, in turn, fuel avoidable refugee crises, across the Mediterranean and Atlantic Seas. Let’s give peace a real chance in Venezuela, in Haiti, and everywhere on our one-and-only blue the beautiful.